People in mixed families — some of whom voted for Clinton and some of whom voted for Trump — may be dreading Thanksgiving and seeing certain relatives. But it isn’t up to me to tell you how to grow up and handle awkward and painful situations. If you haven’t figured it out yet, you are unlikely to learn how to do so here. This doesn’t mean you can’t be thankful. As you likely should be, if you are reading this post. The first time I did a Thanksgiving Day message, it was in the form of a Blawg Review, recounting the time Arlo Guthrie came to dinner at my house for a dinner that couldn’t be beat. That was 2009. In 2011 I wished one and all a Happy Thanksgiving as I celebrated my fifth year blogging. 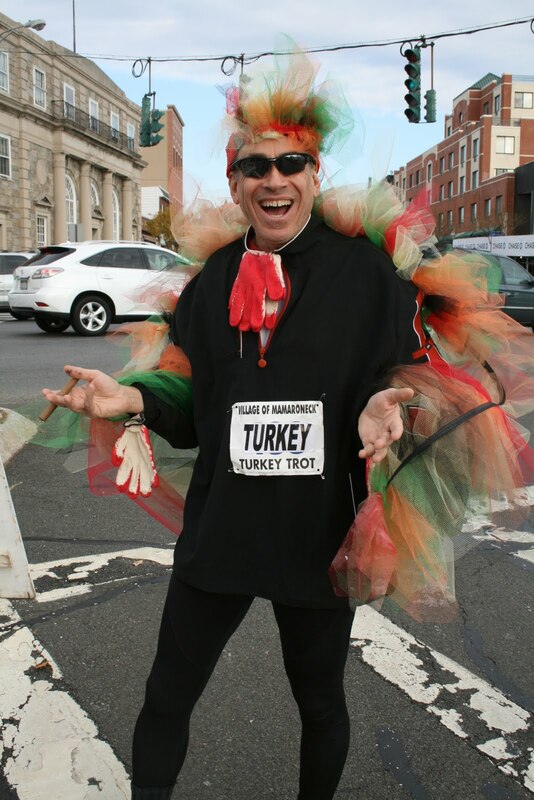 I decorated my blog that year with the photo you see here: me dressed up in a turkey suit for a local race. That message is below. In 2013 I came back with this message to put away those little pocket computers, unless you wanted to use the phone function that some of them have to talk with those dear to you, but perhaps not so near. I am now a blogger for 10 years. And this past Sunday I put on that turkey suit that decorates this post for a local 5K, and I’ll put it on again for another on Thanksgiving morning. Because I can. The costume does not come with a trigger warning. So if I scare the bejesus out of someone — and oddly enough it does frighten some small children — they will just have to deal with it. Running around in a turkey suit sure beats one of the alternative lives I could be having: Living in the anarchy and horror of Syria. Or suffering with the terrorism in France. Or Lebanon. Or Israel. Or Nigeria/Cameroon. Or Yemen. Mali. Iraq. Libya. Egypt. Afghanistan. And I’m only scratching the surface here. There are many different ways to count your blessings. This is the way I want to do it. My original posting from 2011 is below. Now you can see that I have a couple pictures here of me in a turkey suit, shot Sunday at a local Turkey Trot. And you might be wondering what the heck that has to do with blogging, or lawyering, or five-year anniveraries. And, you also might wonder if I’m nuts to put them up here, out of concern that it diminishes the seriousness of what I do for clients in the courtroom. Or that it might be seen by a potential client who will quickly hightail it elsewhere. I see my fair share of human misery come through the doors with busted up bodies that shouldn’t be busted up. Anyone that deals with the consumer end of law will see variations on this theme, from divorce, criminal charges, bankruptcy, etc. And seeing those things gives me (and should give everyone) a greater appreciation for what we have. I know, from seeing it happen to others, that a car could blast through an intersection and instantaneously change my life and those of my family forever. Don’t say it couldn’t happen to you, because it sure happens to some people, who’s only fault might have been sitting patiently at a light. And it only takes a momentary lapse of attention on the part of a driver. There is no limit to the number of ways that life could be quickly altered for the worse, and I’m not sitting in the middle of a war zone. So I am thankful for each day that I get. 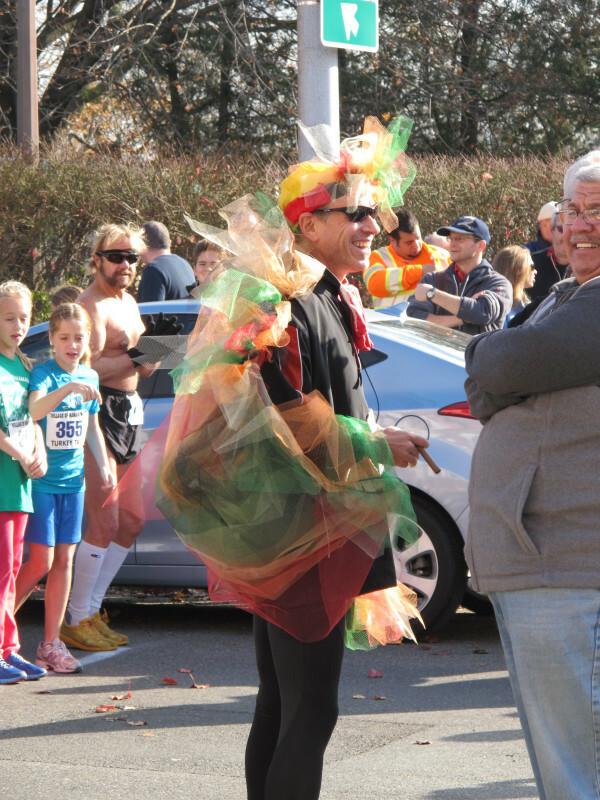 And if I get the chance to dress up silly and run a 1-mile Gobbler race with a few hundred local kids, giving out gift certificates to a local cupcake shop for those that finish near my feathers, then yeah, I’m going to do it. And if I can have a few hundred adults in the 5K race chase the turkey, with a chance to win free entry into a little half marathon trail race I put together, well that is fun too. Community events are often like that. Fun. And it’s nice not just to participate, but to help create them. I decline the opportunity to put on the “serious lawyer face” 24/7. You might see the suit and tie shot on my website, but you won’t see it on my blog. Here I get to let my feathers down. I write this blog the same way I go through life. I try to enjoy it, while at the same time taking what I do for a living very seriously. I think that’s reflected in the 1,000+ posts that I’ve done. And yes, this is the same reason that I have for running the occasional April Fool’s gag. This week is Thanksgiving. Look around you. Be thankful for what you have. And live each day to the fullest. I hate to use Latin phrases in law, as it invariably sounds pretentious, but I’ll make an exception today. Carpe diem. Now if someone could please cue up a copy of Alice’s Restaurant, I’d be most grateful. I hear Arlo may be coming to dinner….